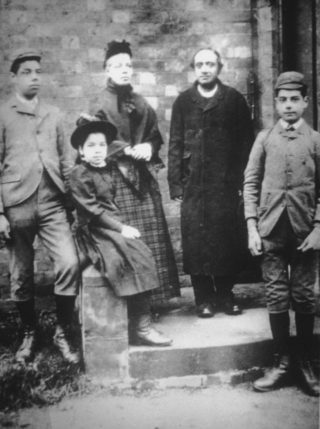 Edalji family, 1892. George is on the left and Maud is sitting next to him. George Edalji (1876-1953) and his sister Maud (1882-1961) lived in Welwyn Garden City from about 1930. They were children of the Vicar of Great Wyrley in Staffordshire. George’s arrest and conviction for wounding a pit-pony in Great Wyrley in 1903 had caused a national sensation. When Sir Arthur Conan Doyle campaigned to have him declared innocent in 1907, it seemed Sherlock Holmes had come to life, and newspapers from New York to Bombay followed his progress with excitement. The story has now been given new world-wide fame by the publication of the novel Arthur and George by Julian Barnes. The starting-point was a series of brutal animal outrages in Great Wyrley in 1903 which culminated in the attack for which George Edalji was convicted. The outrages coincided with the appearance of a series of anonymous letters claiming involvement in the outrages and predicting more, and George was said by the police to have been involved in writing these too. As a result of Conan Doyle’s campaign the Home Secretary ordered a Committee of Inquiry, and eventually gave George a free pardon. He claimed however that as the Committee believed George had written the letters George had brought his troubles on himself and should receive no compensation for his years in prison. There was outrage about this decision in parliament, and in the rest of the country and beyond, but Sir Arthur Conan Doyle could not get it overturned. Decades later Maud and George were still campaigning from their Welwyn Garden City home, and in 1935 local M.P. 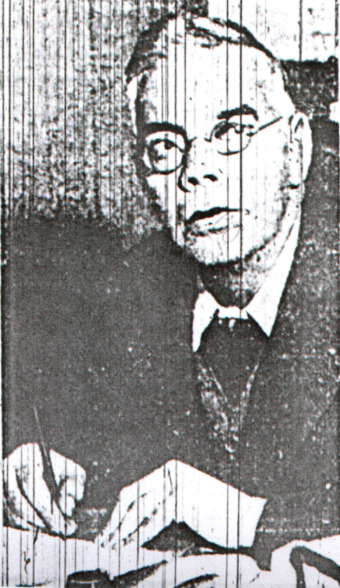 Sir Francis Freemantle wrote to the Home Secretary on their behalf. After George’s death Maud still kept a huge chest full of cuttings about her older brother’s case in her Welwyn house, and fired off letters to publishers of biographies of Conan Doyle to complain about the inaccuracies in accounts of Conan Doyle’s famous campaign. Her efforts to have George declared innocent lasted nearly 60 years. She attended St John’s in Lemsford. After her death she was buried in Welwyn alongside her brother. What an excellent piece of research Roger. I can thoroughly recommend Julian Barnes book – it was a real surprise to discover the link to WGC!